My name is Alex Manners, and I live in a town called Solihull in England. I was diagnosed with Asperger’s syndrome when I was 10 years old, and while it has brought along many challenges that I have had to face, I feel that it makes me the person that I am. I consequently view my Asperger’s as something that I feel lucky to have. I live at home with my two parents and two sisters, and not only have I had to cope with many issues and challenging situations, but so have they. I am lucky to have a large family that includes 17 cousins, 8 uncles, and 6 aunts, and they have helped me a lot throughout the years and have always given me somewhere to go when I am stressed or if things become a little heated at home. 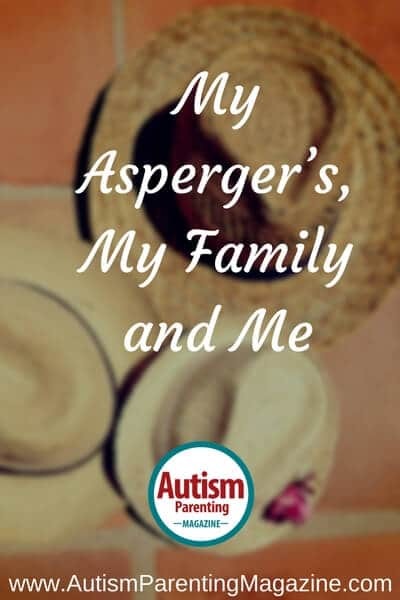 A number of my friends who have Asperger’s don’t have a large family like myself and don’t have that extra support that I have found invaluable. Even to this day, if I ever become stressed, I can always go to my Grandad’s or my uncle’s place or just give them a call. When I was younger, I was always on the phone with one of my uncles when I got stressed—which, back then, was quite frequent, maybe about once every two or three days. When I was first told that I had Asperger’s, my dad told me others in the family had it as well, we were very fortunate, and it made us positively different from everyone else. My Grandad is very eccentric and has many Asperger’s syndrome traits. I have always got on really well with him, and I am just like him in many ways, such as the clothes I wear and the music I listen to. We often enjoy going shopping together and singing all of his old 50’s rock and roll songs around the supermarket. Some of the things that have really caused problems at home have been certain sensory issues, such as the ticking radiator that nobody else seems to notice but drives me crazy. I also have to have all of the labels taken out of my shirts, and my Grandma even has to fix my socks, as I can’t stand the seams. My sisters and I have never really got on, and this all started from when we were very young. For a lot of people with autism, it is probably easier to be an only child. When I was at primary and secondary school, I used to bottle my stresses up until I got home, as I felt a lot more secure there. All of the stresses that I had from the day at school were all crammed up inside me like a bottle of cola. When I got home, one little incident that for most people would not have even been a bother would make me explode. That one small incident would make that final little thread of string inside of me snap, and I just could not think of anything else or see any way out of the anger. After about one hour, I would usually go to my room and just cry, as I did not want to get angry at my parents but saw no other way of dealing with my stresses. Two things that used to calm me down were chocolate and children’s television. I used to be more frustrated when I was hungry ,and so chocolate just took that frustration out of me. I have always liked watching children’s television, and as soon as my mum put on a children’s program, I used to instantly feel relaxed. All of the stresses and worries would just go in an instance, and I would become glued to the television. It must have felt like magic to my parents. A lot of people with Asperger’s syndrome struggle in social situations, but for me, this has been an area where I feel my Asperger’s has really helped. From a very early age, I really enjoyed talking to and being around adults. When I went into a restaurant, I would always insist I would have to eat off of the adult menu, as I was a very good eater and would try all sorts of weird and wonderful foods. When we used to go on holiday, I would always prefer going and looking around wool shops with my grandma than playing on the beach with my cousins, and I could always keep up with adult conversations even though, at the time, I would have only been around nine or ten years old. My Uncle Tim has always been one person I could always—and still can—rely on to calm me down whenever I was stressed. Like many people with Asperger’s, I have a subject that I am obsessed with: football. My uncle would always be taking me to football matches on the weekends up and down the country, and this was a huge stress reliever. If ever I was stressed at school, I could always think about recent trips that I had had with him to different matches and ground or look forward to up-and-coming matches. I would always buy a program from each and every match I attended, and if ever I was feeling a little stressed or panicky during the school day, I would always have somewhere quiet I could go to have a read of my programs. My Grandad has also been someone who has had a huge part in my life. Every Friday evening, without fail, I would go after school and stay the night at his house, which again gave me something to look forward to. As I have become older and have started my own business creating promotional videos, I have started to stay at his house more often, some weeks spending more time at his house than at my own. As I mentioned previously, living with Asperger’s has had its many challenges—not only for me but also for my family. My dad, for instance, put a lot of time into helping me get my statement (for special needs) and in fighting a lot of my battles at school. They included incidents such as teachers not understanding my Asperger’s, homework struggles, changes that were made to the school day, and many more. My Mum, on the other hand, felt the full force of my stresses and challenges and has been the one person who has always been there through most of them. Now that I have become an adult, I have been able to cope better in stressful situations and find solutions that help me when I am feeling stressed. I have started my own little business creating promotional videos and have an ambition to become a TV presenter in sports or children’s TV, which are my two main passions. Being able to share my experiences with Asperger’s will hopefully help others, and I feel lucky and privileged to be able to do this. Alex Manners is 20 years old and from the UK. He was diagnosed with Asperger’s syndrome when he was 10 years old and looks upon his Asperger’s as positive. It is something that brings out his colorful, quirky, and unique personality. He has an ambition to become a TV presenter and also has an aim to watch a match at all 92 English Football League Clubs.